The Moving Targets Catalog is making great progress, with all six essays submitted, the sections established, and images mostly in place. It is very exciting to see the last two years of our work come together in a concise physical form that can be considered as a whole and shared widely. A special thanks to our designer, Lisa Rasmussen, who has been a delight to work with! We have launched our crowdfunding site on Indiegogo and hope to raise $7500. It includes an awesome video that was shot by Keith Reimink of DALIBORKAfilms (thank you Keith!) and was edited by Steffi. Please have a look at us discussing our project! It has been up for a week, and we have raised $550–not a bad start! We are planning a big launch after this holiday weekend. Please consider a contribution! Any amount helps and keeps the momentum going, and we have some great perks in return for your generosity! And please spread the word! We are also working toward our exhibition at Christine Frechard Gallery in the Pittsburgh neighborhood of Squirrel Hill, which will open on August 29 and run through September. Along with exhibiting Moving Targets (sans Portrait Gallery), we will be creating complementary works for sale! 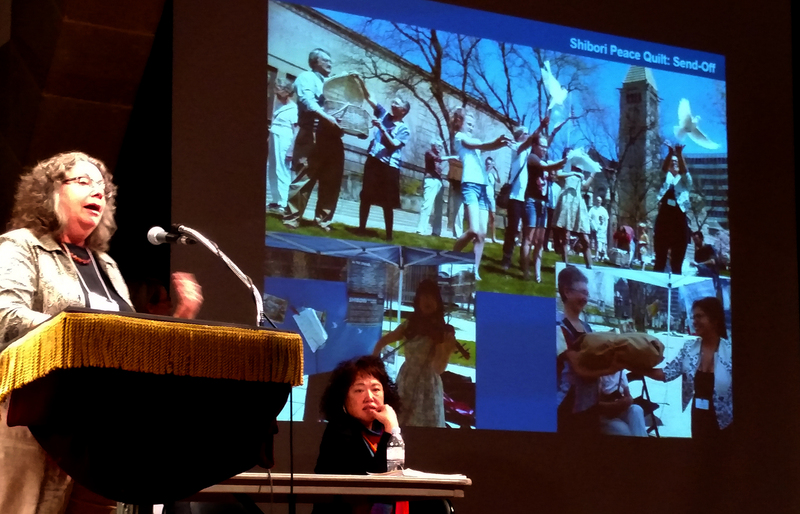 In April, I attended two conferences: Open Engagement in Pittsburgh and the Peace & Planet Conference in New York City. Though these were both about activism and citizen engagement, they were strikingly different in approach and attendees. Open Engagement as described on their web site is “…an international conference and platform to support socially engaged art… The conference mission is to expand the dialogue around socially engaged art, as well as the structures and networks of support for artists working within the complex social issues and struggles of our time.” (Photo: Lunch at Conflict Kitchen from artfcity.com). Most of the conference attendees were in their 30s and 40s. I sought out environmentally themed panels, of which there were disappointingly few. I am seeing a disconnect between “social practice” (current buzzword for socially engaged/community art) and environmental/ecoart. Why? I can’t help but think this is a repeat of the long-standing nature/culture dichotomy, or the “my issue is more important than your issue” conundrum. How can this be in the face of climate change with its significant impacts on ALL life on the planet? By far, what resonated the most for me was Rick Lowe’s lecture that concluded the conference. 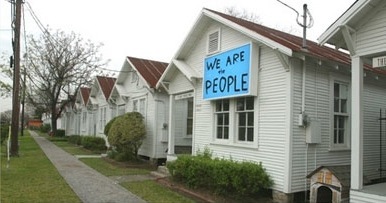 I have followed his Project Row Houses for years–a groundbreaking and ongoing community arts project (photo left from their web site) . He was refreshing in his honesty and humility, talking in plain language about his struggles, successes, and failures as an artist. He concluded his talk with (from my notes): Revolution is always happening rather than being a set moment in time. It is a sustained movement of empowering the powerless. The end result of “social change” work is justice. Lowe ended with: ‘When do we have the courage to claim what we believe?’ I found this question to be extremely powerful. Unlike the 60s where everyone claimed what they believed (for better or worse), it seems that people are not willing to stick their necks out to speak their truth and their convictions. Perhaps it is because it is too easy these days to get your neck chopped off publicly (via social media), as happened to Patricia Arquette recently in her Oscar acceptance speech when, unfortunately, she trumped civil rights with women’s rights. But, we all knew what she was getting at, did we not? And she had the courage to say what was in her heart. I applaud her for that, though, we must get beyond one issue trumping another (more on that below). The other conference I attended was the International Peace and Planet Conference, which was a precursor to the United Nations Nuclear Proliferation Treaty Review. I found this conference to be in sharp contrast to the OE Conference–the attendees were mostly older, many who have been deeply active in the peace and justice movement for decades. 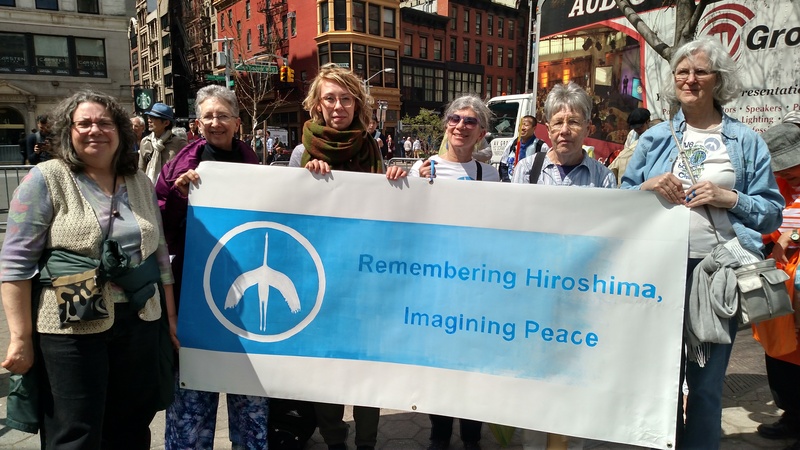 As a member of Remembering Hiroshima, Imagining Peace (RHIP), I presented with Jo Schlesinger and Taylor Hennessee as part of the Global Hibakusha workshop. We were all struck by the idea of expanding “hibakusha,” which refers to atomic bomb survivors from WWII, to include others impacted by atomic testing and mining. Testimonies from the Marshall Islands and the Navaho Nation along with survivors from Japan were moving and inspiring. I was deeply touched that they enjoyed our presentation as well and recognized the power of art to raise awareness and effect change. (Full story on the RHIP web site). I also attended a workshop on Militarism and Climate Change that was eye-opening. I had never thought much about this connection, but there is one: what is the carbon footprint of the military, of even one jet fighter? 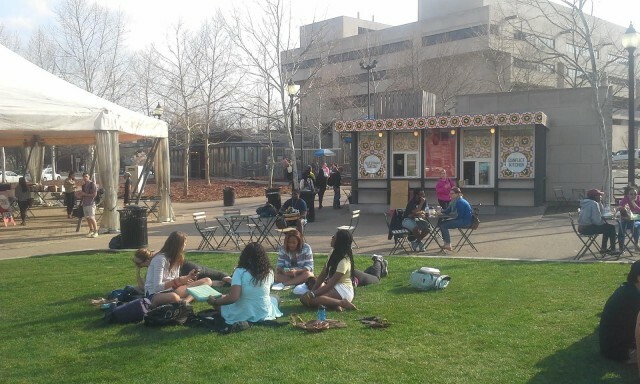 A rally, march, and festival comprised the second day of P&P events. The march was wonderful, with banners waving, people singing, and peace cranes being handed out to passersby and police. At the festival, we presented the Shibori Peace Quilts we made with the Children’s Museum last fall to the Shinfujin/The New Japan Women’s Association, who have taken the quilts back to Japan to be hung in their new home at the Chihiro Art Museum in Azumino. It was a very satisfying conclusion to the conference–the Shinfujin women were thrilled with the quilts. I think they had no idea how beautiful they would be! In contrasting the two conferences, I found them both to be hopeful and affirming, despite the problems. They both attempted to address some of our most pressing social issues. However, where the P&P conference sought to connect social and environmental justice, the OE conference had a blind spot. The P&P conference still has a long way to go to connect the issues and make them relevant to younger generations, but they are keenly aware of this. I was heartened by the OE conference–its youth, energy, and commitment. However, though they are connecting some social issues, they have not made the connection between justice movements. Activist movements continue to flounder because we are not connecting the dots. All these issues have the same root causes, and at this point in our human evolution, we must address them together. Remember divide and conquer? Let’s not be fooled into being territorial about “our issues.” Social justice is coming to the fore again with the “Black Lives Matter” movement, but it must be expanded to ALL lives matter, and all LIFE matters, including the non-human others who have a right to their existence as we have ours. Catching up… half way through 2016! Moving Targets – Fall Update!